Gallardón was scheduled to attend the antichoice conference to bang on about how great his bill is. But to everyone’s surprise Gallardón has pulled out at the very last minute from programme. The reason being, if we are to believe his spokesperson, that official reports on the draft bill are still pending and therefore Gallardón has not had time to edit the last draft and determine its final details. The Minister is apparently unwilling to do a presentation on an unsettled bill in front of his antichoice cronies. Gallardón is not exactly known for his self-doubt, in fact, he is known for quite the opposite as last year has shown: he has defiantly clung to his bill, unperturbed in the face of relentless criticism, steadfast in his belief that his law is a morally correct one. 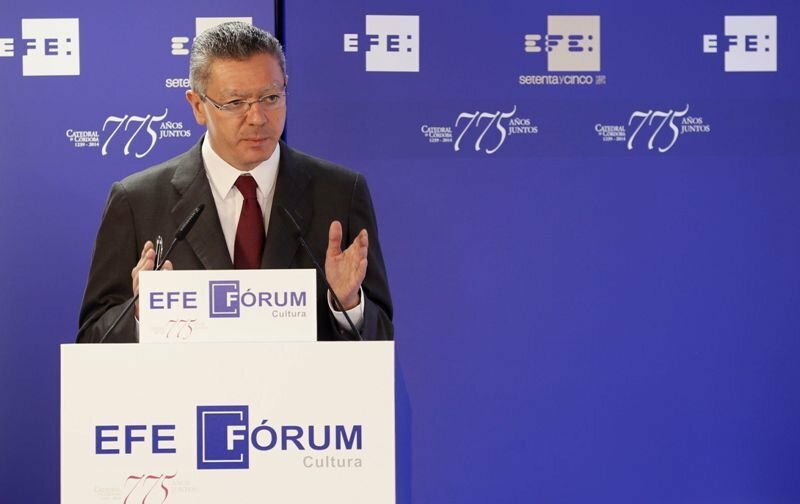 We have to presume that Gallardón’s present hesitancy is due to something other than a crisis of confidence. The Spanish PM, Mariano Rajoy, forever the coward, prefers controversial issues to be resolved as quietly as possible. Well, this was never going to happen, what with socialists in the lower house deliberately scheduling a prochoice convention to go head to head with the antichoice convention. Indeed, Spanish media had their tents pitched up and their popcorn ready for the face off. Gallardón’s sudden withdrawal from the antichoice meeting has, as one newspaper put it, clearly “deflated the soufflé”. But what does this mean for us? It means that we keep fighting: as the bill’s controversy continues to gain international attention, the Spanish government’s embarrassment over this barbaric law grows, whilst Rajoy and other members of the Partido Popular get ever more uncomfortable and impatient with Alberto’s political gambling. Gallardón’s lack of attendance at the Madrid antichoice conference is therefore a major coup for prochoice campaigners. Don’t think that little retweet or your presence at a demo don’t count, because they do. Help Spanish women defeat the bill: spread the word about My Belly is Mine and join the campaign! My Belly is Mine protested peacefully at the Spanish Embassy on Friday, the 27th of June, 2014 against the Spanish antiabortion law. We had taken the lead from the Spanish Federation of Feminist Organizations, also known as Coordinadora Feminista, which had announced that it was protesting against the law in front of the Spanish Ministry of Justice, in Madrid, that day. The location for their protest was apposite as the main force behind this unjust law is Spain’s Justice Minister, Alberto Ruiz-Gallardón. The date was also appropriate to begin with, as the government had announced that the draft bill would be entering parliament on the 27th. At the very last minute, however, Gallardón postponed the bill’s entry to parliament to coincide with the antichoice conference in Madrid. Nevertheless, the protests around Spain and in Madrid, not to mention abroad (Berlin, Vienna, Lisbon, Marseille, Burgundy, Montevideo…), went ahead. In support of our fellow activists in Spain, who should be free to protest and defend the rights of their countrywomen, we would like to express our condemnation of the unnecessary brutality of the Spanish police.